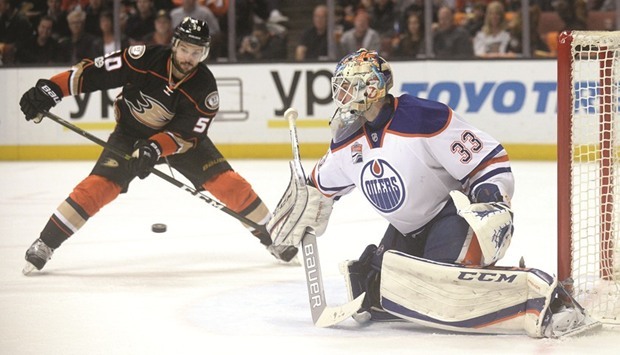 Patrick Maroon scored the decisive goal and Cam Talbot stopped 39 of 40 shots as the Edmonton Oilers defeated the Anaheim Ducks 2-1 on Friday at the Honda Center. The Oilers now head home to Edmonton for the next two games with a 2-0 lead in the best-of-seven series. Game 3 of the Western Conference semifinal series is Sunday. Anaheim outshot Edmonton 40-23, including 16 shots in the third period, but Talbot was the difference. Anaheim’s lone goal came off the stick of Jakob Silfverberg. John Gibson made 21 saves for the Ducks. The Oilers took a 1-0 lead on defenseman Andrej Sekera’s unassisted goal, his first of the playoffs, at 1:05 of the first period. Edmonton extended its lead to 2-0 on Maroon’s power-play goal, his second of the playoffs, at 6:41 of the second period. Elsewhere, Vladimir Tarasenko scored a power-play goal late in the first period and then connected for the game-winner with 3:51 left in the third period to lift St. Louis 3-2 over Nashville. The loss was the first in the playoffs for the Predators this season and left the second-round series tied at one game apiece heading into Game 3 on Sunday in Nashville. James Neal and Ryan Ellis scored to give the Predators a 2-1 lead. The Blues tied the game at 2 on a goal by Jori Lehtera at 7:39 of the third period before Tarasenko took over. Jaden Schwartz started the play with a pass that deflected off the skate of Joel Edmundson directly onto Tarasenko’s stick, and he blasted a shot past goalie Pekka Rinne.